Anything New Under the Turtle Bay Sun? I first read poet and novelist May Sarton's memoir Plant Dreaming Deep back in 2003. I've reread it a couple of times since then. It's so good that it's perhaps more accurate to describe Sarton as "memoirist, poet, and novelist". Sarton describes here move to Nelson, N.H., near where I lived as a child and the people she met there and the life they lived starting in 1958. 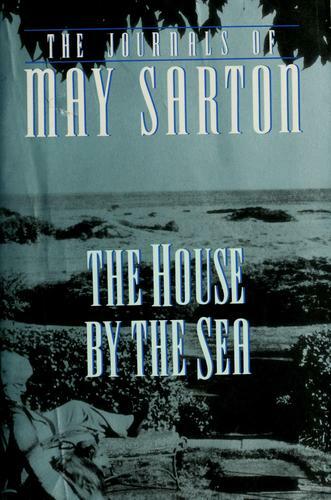 Wednesday, I started reading a later book of hers, The House By the Sea, which recounts the period from November 13, 1974 to August 17, 1976, after she left Nelson and moved to the Maine seacoast. "Here we come to the essence of the argument. No state throughout history has had completely clean hands. What marks the progress of civilization is the systematic recognition of laws, the identification and punishment of crime, and the reprobation of the offender. A civilized society is one which sees evil in itself and provides means to eliminate it, where the voice of conscience is active. the horrific record of Britain's indiscriminate bombing of Germany is in part redeemed by the protests of Bishop bell of Chichester. The brutalization of Vietnam by the United States is balanced by the critical millions who eventually brought it to an end. We need not despair at the devastating events of our times so long as we retain the ability to distinguish between right and wrong, between law and disorder, between justice and crime, and proclaim these distinctions from the roof-tops. "The tragedy of the U.N. is that the distinctions have been first blurred, then wholly abandoned; and that its judgements are now delivered not according to any recognized set of principles, however inadequate, but solely in response to the pressures of political and racial groupings. Racialism is condemned in South Africa but applauded in Uganda; and the fruits of aggression are denied or blessed according to the race and political leanings of those to whom they accrue. Thus the UN has become a kind of kangaroo court; far from protecting international order, it undermines it. Not even the wretched League of Nations gave a welcome and a platform to Hitler." It is possible, I suppose that we are returning to a Dark Age. What is frightening is that violence is not only represented by nations, but everywhere walks among us freely. One might even make a distinction between terrorism for an ideal or a dream such as the PLO and that which we condone here at home, violence for no reason, as a game or a way of snatching a few dollars. Are we in the West on the way out partly because we have provided our people with almost everything except an ideal. Now there's plenty here to disagree with. The Whig View of History for a start, which plays out in the idea that the West doesn't have an ideal to propose—a consequence of believing Whiggishly that the ideals of the past have been surpassed and discredited. But there's plently to reflect on profitably as well, I think on the day that the Palestinian Leader again goes before the U.N. General Assembly. Potok: ... Interestingly enough, I feel closer to someone like Joyce [than Roth] who really did, in terms of models, precisely what I'm trying to do. Joyce was right at the heart of the Catholic world and at the same time at the heart of western secular humanism. And this confrontation, both as an artist and as a human being in the twentieth century was a core-to-core confrontation. As a human being, he fused his Catholicism with his secularism and produced a Catholic-secular way of writing, if such a thing is possible. His epiphanies, his sacrament of language, the way he structures and sees things are all Catholic, Jesuitical, and he went the secular route through his Catholicism. That didn't happen to me. I stayed inside the Jewish tradition and took the secular into it. He took the Catholic into secularism and I took the secular into Judaism. Kremer: Do you feel a similar kind of kinship to Flannery O'Connor? Potok: To O'Connor, and interestingly enough, in no small measure, to Greene, who grapples with the problem of evil in a strange Catholicism. There are models, in this century, for what it is I'm trying to do with my work, but they aren't people like Roth. WKCR (89.9 FM) at Columbia University has a clever name for their morning classical music program, "Cereal Music"
An eclectic mix of music, spanning the Baroque, Classical, Romantic, and Modern periods. Tune in to hear such composers as Bach, Shostakovich, Bartok, Stravinsky, Schubert, Janacek, Carter, Schoenberg, Haydn, Hindemith, Debussy, Part, Boulez, and many others. From time to time, we present entire shows focusing on everything from 19th century lieder to 20th century string quartets, from Bach's cantatas to Scriabin's piano works, from the American art song to modern Russian masters. They are, of course, punning on "Serialism." For related sounded offbeat radio programs: KBOO's Celebration of Dada and Surrealism. 33.7 x 26.5 cm (13 1/4 x 10 7/16 in.). The night and particularly the electrified night are the topic of a show of photographs closing this weekend at the Metropolitan Museum of Art, "Night Vision: Photography After Dark." Sid Grossman's "Mulberry Street" (at right) is part of the show. 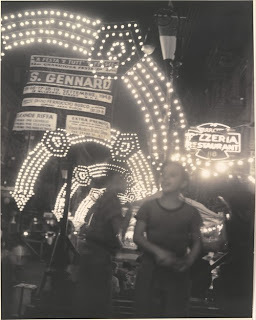 It depicts the lights and gates of the San Gennaro Festival in Little Italy (coincidentally in its first of two weekends today and tomorrow). There's some really fascinating work in the show, but it's appeal is damaged by the installation. The room is small and dark with a lowish ceiling and dark blue or black walls. The effect is claustrophobic, even on what was a relatively uncrowded day at the Met. But furthermore, this unpleasant presentation strikes me as unnecessary. Shouldn't part of the point of photographs of the night be that they convey the feeling of the experience when you're not actually in a darkened space? The relative uncrowded condition of the museum today can be attributed partly to the passing of the seasons from Summer into Fall and partly to the Steuben Parade marching up Fifth Avenue, which made getting to the museum more challenging than usual. I've been looking at some old copies of The Remnant. The February 28, 1995 issue includes Fr. Eugene J. Dougherty's "'Marching Song' for the Traditionalist Movement." It's written for the tune AUSTRIA (MIDI), also known as the tune for the Kaiserhymne and the German national anthem. It's not the world's greatest rewrite, but it's at least an historical curiosity and perhaps still has some value as a reassurance/examination of conscience for "traditionalists." I've preserved the somewhat idiosyncratic capitalization and punctuation. Fills my heart with veneration, guards my Faith and makes it whole. Let the Church not split in schism; Falsehood, heresy prevent. In they loving arms, enfold us, in the Blessed Sacrament. Lest Thy present crucifixion lead me into dark despair. Send her forth in Apparition, Comforting the penitent. Lord, protect the Holy Father, Give him strength to lead his flock. While the tempest rages o'er us, shelter us upon this Rock. Make him strong his Church to shepherd, Make our hearts obedient. Lord, restore Thy Holy Priesthood; Raise Melchizedek of old. Changing bread to thine own Boday, Wine to Blood our nourishment. Lord, bestow Thy Benediction, Foretaste of Thy Paradise. Shining forth in Awesome Beauty, Lo the Holy Sacrifice! O God, who didst break the chains of blessed Peter the Apostle, and didst make him come forth unscathed, loose the bonds of Thy servant, N., held in captivity by the vice of (Name it); and by the merits of the same Apostle, do Thou grant me to be delivered from its tyranny. Remove from my heart all excessive love for sensual pleasures and gratifications, so that living soberly, justly and piously, I may attain to everlasting life with Thee. Amen. 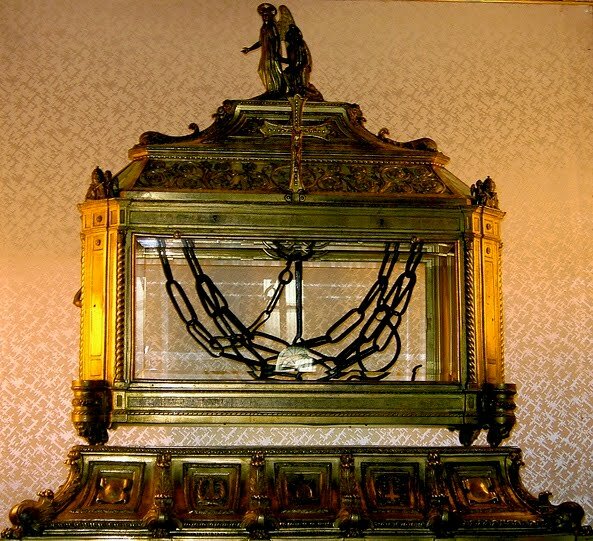 Photo of St. Peter's Chains from Flickr user Alex Beattie under a Creative Commons Attribution 2.0 Generic license. Pursuing the figure of Socrates through the Loeb Classical Library leads, then, to troubling conclusions. There's no reason to think that Xenophon's dull moralist or Aristophanes's comic foil is closer to the real Socrates than Plato's philosopher -- rather the contrary, since Plato was the closest to Socrates of any of them. But the three portraits are a reminder that we have no direct access to the real Socrates, whoever he was. We have only interpretations and texts, which both reveal and conceal -- just as ancient Athens has exercised such enormous sway on the imagination of the world based solely on the texts and images it left behind. Even so, the Loebs' promise of completeness is spurious -- after all, the Library can only give us what survives from 2,500 years ago, which is a tiny fraction of what the Greeks and Romans wrote. (We have eleven plays by Aristophanes, but we know he wrote forty.) The image of the Loebs on the bookshelf is an emblem of total knowledge, yet the totality is an illusion -- even if it's the kind of illusion that may be more intellectually empowering than truth. For what it is—obviously aimed more squarely at selling books than other literary reviews—I'm impressed with the seriousness and quality of the Barnes and Noble Review for what it is, though it's more . "The final lines of [another poem] Autobiography express Zukofsky's fear of permanent alienation from his upbringing and tradition as a bitter triumph of successful assimilation: 'Keine Kadish wird man sagen'. The lines are a variation on lines from Heinrich Heine’s poem Gedächtnisfeier [Memorial]: 'Keine Messe wird man singen, / Keinen Kadosch wird man sagen, / Nichts gesagt und nichts gesungen / Wird an meinen Sterbetagen'. ('No Mass will anyone sing / Neither Kaddish will anyone say, / Nothing will be said and nothing sung / On my dying days')"
Und sie seufzet: Pauvre homme! Will walk out in Montmartre. "It was two days before the Nativity of the Mother of God..."
"It was two days before the Nativity of the Mother of God, and they were reciting the litany of the day. It was an inexhaustibly eloquent outpouring of praise for the Virgin, and Yakonov felt for the first time the overwhelming poetic power of such prayers. The canon had been written not by a soulless dogmatist but by some great poet immured in a monastery, and he had been moved not by a furious excess of male hunger for a female body but by the pure rapture that a woman can awake in us."